Are you just starting out and looking for a good pickleball paddle for beginners? If so, we understand that you probably want a decent paddle but may not be ready to spend a lot of money. This Champion Pickleball Paddle is a reliable pick since it meets both those criteria and has also been one of the best selling paddles on the market for the past 20 years! However, there are several other top-rated beginner options that we’ve reviewed for you below. With the rapid growth of pickleball, there are so many new paddles being launched that the choices can be overwhelming (well over a hundred to choose from now). The paddles that we track on that link above are some of the best quality paddles on the market – but they come at a high price. And in our honest opinion, if you are a beginner, those may not be the best option since you end up paying top dollar for features that those pro-level paddles offer but you probably don’t need when just starting. So to help you narrow down your choices, we’ve come up with a list of top beginner picks along with detailed reviews to help find the paddle that best fits your playing style and budget. How to Choose the Right Paddle for you? **You’ll find our more detailed reviews below, but you can also click the links above to read customer reviews and see more details on Amazon. Price: All of the beginner paddles reviewed here fall somewhere in the “mid-range” of the price spectrum. Currently, pickleball paddles sell for anywhere between $10 to over $150. The options on our list are not the latest and greatest paddles but they are also not the cheapest pickleball paddles either. This list is somewhere between those two extremes, you can click the links to check current prices but at the time of writing, we chose paddles that were all priced under $75. 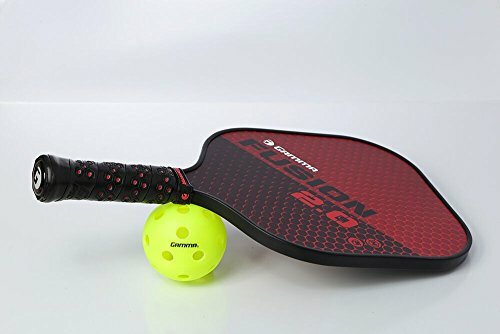 So, if you are planning to play pickleball somewhat regularly, looking for a paddle you can play with as you improve …you want a quality paddle but not necessarily top of the line… this list is perfect for you, please keep reading below. However, if you are just trying out pickleball for the first time and you’re not even sure you will be playing long term…and just looking for a cheap paddle click here to see a list specifically with a low budget in mind ($30 and under) for people that just need an affordable paddle. Material: We did not include any wood paddles on this list, if you are looking for a good wooden paddle please see link above for budget paddles. All of the ones on this list here are graphite or composite. Paddle Technology: Since this list if for beginners, we’ve left off all the cutting edge paddle tech. Pickleball brands continue to push the limits of what they can offer, some of the high-end paddles use aircraft grade composites, specially textured faces and vibration canceling cores. Edge Guard: All of these paddles have a protective guard around the edge, it protects the paddle from damage and wear & tear. We don’t generally recommend edgeless paddles for beginners but feel free to click the link if you want to see the options in that category. USAPA Approval: if you want to play in sanctioned tournaments you’ll need to have an approved paddle. While some beginners will eventually want to compete it’s not necessarily a priority for most. While more expensive paddles are almost always approved (since the buyers tend to be competitive players) some of the paddles on this beginner list are not, although we did manage to include a few that are approved- in case you foresee entering a tournament in the near future. 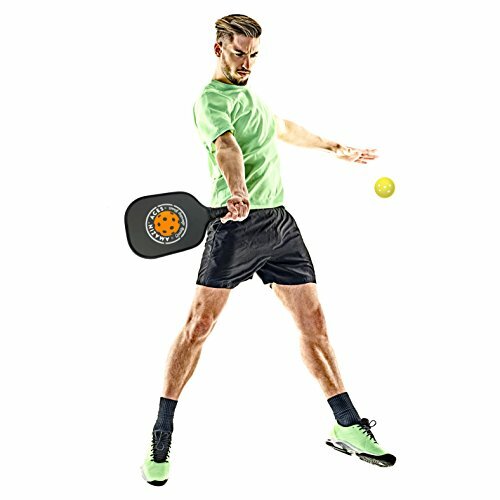 Since we first published this article the pickleball paddle market has been booming with lots of new options available and high-quality products at more affordable prices than before so we have expanded our reviews to include more graphite paddles in our picks for top beginner paddles. The Upstreet Graphite paddle is a great quality beginner paddle at a reasonable price and also includes a free neoprene case. Unless you are on a very tight budget that only allows for a beginner wood paddle… it’s worth considering this one by Upstreet as your first paddle. The arrival of the ProLite RockStar edged out our previous top beginner pick and at the time it launched took center stage as our pick for the best composite paddle under $50 (check current price). The new quiet polymer core and ProLite’s lifetime limited warranty pushed the lightweight Rockstar to the top of charts in this beginner category. If you’re not into trying new things, you can’t really go wrong with the Vintage Champion 2.0. Made by Pickle-ball Inc. the original company by the founders of the sport, this paddle has been on the market for over 2 decades -proving it’s a reliable classic. 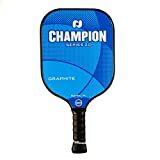 If you are sure that you want a graphite pickleball paddle and are willing to spend slightly more please click here to see our top picks in that category. Weight: The #1 most important buying factor in this range is weight. Heavier paddles give you extra power, that will add a boost to your shots – especially long drives from the baseline and your serve. Lighter paddles are easier to control and maneuver which helps when you are playing at the net, “dinking” and playing the slow game up at the kitchen. If you do not have any injuries, especially tennis elbow or arthritis, you should be able to handle a heavier paddle. But if you do have any of the issues mentioned above – go for a mid-weight paddle (somewhere in the 7.3 to 8.4 oz range). It’s also important to select a grip that fits your hand size. We’ve listed the grip size of each paddle. When in doubt between two sizes, get the smaller of the two. Here is the quick and easy way to determine grip size just based off of your height. If you’re looking for a more detailed guide to buying your first paddle and other factors to consider, please see our Complete Pickleball Paddle Buyers Guide. The Champion paddle, made by the Pickleball-Inc, the original startup company from the inventors of the sport. This paddle model has been around since 1998 it has become an industry standard and one of the best selling mid-range paddles. The Champion weights an average of 7.9 oz ( +/- 0.3 oz). The large sized hitting surface gives this paddle a large sweet spot that helps beginner plays hit their shots consistently. The Champion offers a good weight for beginners and a nice balanced feel. One of the great things about the Champion paddle is that it is offered in two grip sizes (something we wish more paddle companies would offer), this makes it much more versatile as players with small or medium hand sizes (4″ or 4 1/4″) can find an option that fits their hand. Players with larger grip would opt for the 4.25 grip and just add some overgrip tape to build up the handle circumference to match your grip. The flared end caps at the end of the handle make it easier to keep a solid grip on the paddle and keep it from slipping. In 2017 the Champion did get an upgrade with stronger edge guard (and the bonding that holds it to the paddle) as well as a newly improved surface on the face. But at its core it’s still the paddle – just improved. For our full overview and comparison of the different Champion paddles see here. This midweight (8.0 oz) paddle by Gamma Sports is the recent remake of their original Fusion paddle. The widebody face is finished with a textured fiberglass face gives the paddle good touch while still packing eight ounces of punch for your hard drives. The wide paddle face has a large sweet spot and is an easy shape for beginners to start using. The 4″ grip on the Fusion 2.o pickleball paddle makes it ideal for small hands and the handle is Gamma’s comfy honeycomb grip. The company is well known for grips and this is one of the pros to buying their paddles is that they offer a comfortable and solid grip (some other brands actually use Gamma grips on their paddles and players like the Gamma replacement grips to upgrade old worn grips. The Fusion 2.0 is approved for tournament play by USAPA. Click here to read customer reviews and check the price of the Fusion 2.0 paddle. The Neo composite paddle is a great solution for beginner pickleball players looking to maximize their game while reducing the impact on their wallet. According to Selkirk’s own website, this paddle was developed to fill the gap they saw in the pickleball industry for novice players between the very basic starter wood paddles and the premium high-priced honeycomb paddles that were available. Feeling that beginners were not able to enjoy the full potential of the sport with the low-end wooden paddles on the market, the NEO was developed. This paddle is built for power using Selkirk’s trademarked PowerCore™ polymer core, the same core used in their high-end paddles. 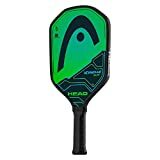 The Neo sells for a more affordable price point, selling for about half the price of the 30P XL Epic Polymer Graphite Pickleball Paddle which sells for about $100. The NEO composite paddle, like all of the others from Selkirk Sport, is manufactured in Hayden, Idaho. Although you can find decent foreign-made equipment on the market (many pickleball paddles are made in China), having a product made in the United States of America is an added plus. Selkirk does produce quality products and the one year warranty they offer against manufacturer defects does add peace of mind when purchasing their products. The paddle boasts a sleek Selkirk ThinGrip measuring 4.125 inches, so it’s on the smaller end of the scale for grip size. The EdgeSentry™ edge guard provides added protection to the paddle edge. The average paddle weight is 7.7 – 7.9 oz, making it a versatile option for beginners needing to balance control and power. The paddle face is printed with sharp looking vinyl graphics. The Neo paddle is currently available in Red and Blue. The Selkirk NEO paddle is sure to be a tremendous hit with anyone searching for a backup paddle for friends and family or any beginners just starting out in Pickleball. Since the NEO is approved by the USAPA for tournament play it’s also a great option for a player who is moving up into competitive play. The higher end of price range for paddles on this list. However, if this is within your budget this would be our top pick for your first paddle. Another very popular seller on Amazon is the Amazin’ Aces Graphite Pickleball Paddle. It’s slightly heavier the other paddles listed above, weighing 9.2 oz (compared to under 8 ounces) that extra ounce is a consideration. At over 9 ounces it definitely lands it in the heavy category. While that extra ounce will deliver plenty of power. The boost of power combined with the soft touch core, make this a good all-around paddle for a beginner or intermediate players that are currently playing with wood and would like to upgrade. The Amazin’ Aces features a Polymer core which is known to be the softest and quietest on the market (compared to an aluminum core which gives extra pop but at the cost of more noise and vibration. Another benefit of this paddle is that it has been approved by the USAPA. When it comes down to it, the Upstreet (below) and the Amazin’ Aces are very comparable. They are both young companies selling popular beginner paddles on Amazon. The specifications are very similar between the two options. One of the main deciding factors would be- weight, if you want a paddle cover included (Upstreet) or if you think you’ll compete in tournaments (Amazin’ Aces). This young company out of Utah has been selling their paddles on Amazon for the past few years and this budget graphite paddle continues to be one of the top-selling paddles in its category. Although the Upstreet Graphite paddle comes in several unique designs, under the hood they are all the same. It’s an 8 and a half ounce paddle with a graphite face over a polymer honeycomb core. The paddle comes with a 4.25″ micro-dry comfort grip designed to wick away sweat and keep your hands dry during play. One of the benefits of buying an Upstreet paddle is that they include a neoprene paddle case. Many other brands sell these separately ($10-$15) so it’s worth factoring that into the price when you do your comparison shopping and decide which paddle to buy. As a beginner, you may not be making plans to compete in tournaments any time soon but we do want to mention that this paddle is NOT approved by the USAPA so keep that in mind if you have any interest in getting into competitive play down the road. This is a great cost-effective option for an entry level composite paddle. The Rally Tryo paddle delivers quality design at a much lower price point than you would expect for similar composite paddles. It’s a couple steps up the ladder from a basic wooden paddle and the quality of the materials is similar to what you would see in a more premium mid-range price point. The Tyro 2 paddle weighs in at under 7 ounces (6.7 ounces) making it a great lightweight beginner option! The paddle face is made of polycarbonate laid over Polymer honeycomb core. The pure white face and black grip make for an elegant design and great choice for a pickleball player looking to avoid some of the flashy colored paddles we see more and more on the court. 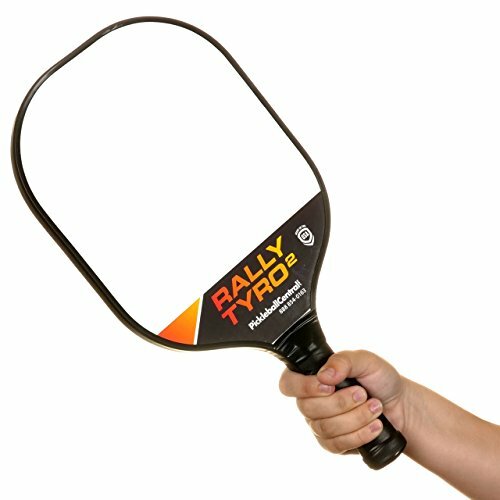 One important factor to consider is that the due to slight texture variation on the paddle face, the Rally Tyro has NOT been USAPA approved for tournament play. If you plan to compete in official events, you’ll want to look at something like the Selkirk Sport NEO Paddle above which is USAPA approved. Otherwise, this Rally paddle is good pick in this category for a beginning recreation player who isn’t looking to win any trophies (yet!). Rally Paddles is a well-known brand, run by the folks at Pickleball Central – one of the largest online retail pickleball equipment sellers. Not approved for USAPA tournament play. The Rally Tyro Pro recently came out as an upgrade version of the earlier Tyro 2. This new “Pro” version of the paddle has a few upgrades, including vibration dampening core technology to reduce the shock from repeatedly hitting the ball. The face is finished with a “velvet” enhanced texture face to improve the touch and feel of the paddle. The Pro has a medium grip measuring 4.25″ in circumference with a 5″ long handle. The weight range is 7.5 – 7.9 oz with average paddle weighing 7.7 ounces. Head made news in the pickleball industry in 2017 when they launched a whole line of paddles, this move from such a large and well-known tennis brand was a vote of confidence for the growing market. The paddles definitely have a look and feel that will appeal to cross over players coming from a tennis background. We previously reviewed the Tour and Pro paddle lines which are their higher priced paddles. The Xtreme Elite is marketed as a control paddle with its thinner core and lighter weight. The Elite is a less expensive paddle than the Tour and Pro lines. However, as a beginner, the Extreme Elite is still a suitable option. The main difference between this paddle and the more expensive Head options is that the Elite comes with the company’s “Ergo” grip (compared to the Head “Comfort” grip on the more expensive Head paddles). The Elite also do NOT have the “Extreme Spin Texture” that is featured on the Head “Pro” and “Tour” paddle faces. So if you are looking for a more affordable budget paddle and are willing to pass up the nicer grip and not really worried yet about adding spin on your shots, the Extreme Elite could be a good starter option for you. This paddle has been discontinued since we originally wrote this review but we’ve decided to leave it up just since we thought the information was useful, for example, if you find this paddle USED …or it’s possible there are still some for sale online. This composite paddle is manufactured in the USA by Pro-Lite Sports. The paddle was designed with former tennis players in mind, the slightly longer racket-like handle on the Pro-Lite Classic will appeal to players migrating from tennis to pickleball as the paddle resembles the look and feel of a tennis racket. The handle measures 6 inches which is one of the longest available on the paddle market. With a width of 7¾, the oblong paddle face should also be a welcome feature for a tennis player trying to find their pickleball swing. The total length of the paddle is almost 16 inches, again one of the longest available. The Pro-Lite weighs in right around 7 ounces falling in the mid-weight category which is really what we recommend for a beginner. The heart of this paddle is filled with quality Nomex honeycomb core while the face is covered in smooth fiberglass for added “pop”. The paddle comes with a small (4 inch) grip but for players coming from the tennis world, most are used to wrapping their racket grips to get the desired fit and the technique would be the same here. The Pro-Lite Classic comes in a variety of colors and is adorned with the company’s lightning bolt graphic. Good transition paddle for tennis players. The small grip may not suit large hands. The Rockstar features a Polymer core which is lighter and quieter than some other paddle core materials but strong and durable. The Rockstar paddle (2019 update: when this paddle first came out we had this as a top pick, unfortunately for unknown reasons we see few of these available online and the ones we see are way more expensive than the original recommended retail price, we’ll update this if we see prices come back down). weighs in at an average of 7.6 ounces (ranges from 7.4 to 7.8) pushing it just over what we would consider lightweight and putting it in that mid-range weight sweet spot for power and touch and making it a good all-around choice for a balanced beginner or intermediate player. The trademarked QuadCore™ Polymer core is considered one of the strongest core materials on the pickleball market (according to the company, it’s the “strongest, quietest, lightest and most durable on the market”. 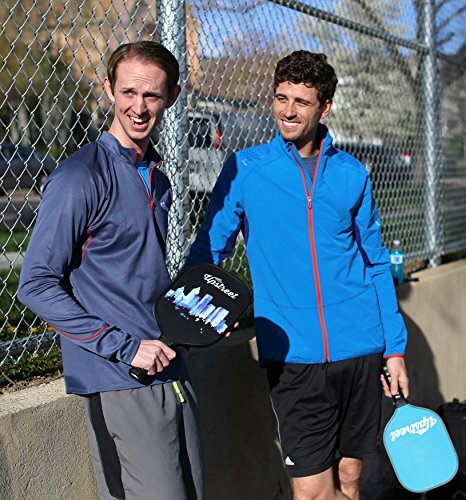 In addition, ProLite is a well-known pickleball company that makes a wide range of products from beginner to high-end paddles used by pro players. The company also offers a limited lifetime warranty which should give buyers peace of mind should anything go wrong with the paddle. The paddle handle has a nice length of 5.5 inches and grip circumference 4 3/16″ which is wrapped in Prolite’s “No-Slip Thin Grip” which is a cushioned “tacky” grip style which has a nice solid feel in your hand during play. The RockStar by ProLite is USAPA tested and approved for tournament play, it’s also rated “Green-Zone” approved for quiet communities. ProLite Sports paddles are Made in the USA. The Rockstar comes in two designs featuring broad colorful brush strokes across the paddle face: Fuchsia Punch (pink and fuchsia ) and Stormy Sunset (orange and yellow). As a budget all around paddle it doesn’t stand out as a great for power or control. Some may not like the 80’s inspired aesthetics of the paddle face. Hopefully, these paddle reviews have given you a few good options for your first beginner paddle and we were able to help you chose the best one that meets your budget, grip and playing style.